A degree in criminal justice can provide career opportunities in federal, state and local government or the private sector. For students looking to gain a better understanding of criminology, criminal justice schools in Iowa equip students with the necessary skills for careers in corrections, homeland security, law and wildlife enforcement services. Iowa is even home to the nation's oldest law school west of the Mississippi River. Learn more about the educational and training opportunities offered at criminal justice schools in Iowa, as well as the types of training and degree level required to work in the criminal justice field across the state. After Criminal Justice School in Iowa: What's Next? In comparing the top criminal justice schools in Iowa side-by-side, students are able to see examples of what they want to look for in a program. 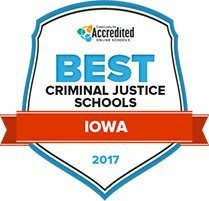 This list takes the guesswork out of tedious research; using the most important factors to students - such as tuition cost, student-teacher ratios and number of criminal justice programs -Iowa's criminal justice schools are ranked from top to bottom. Find more about each program and the factors that help dictate each school's score below. The police science technology program at WIT results in an associate of applied science degree. The program gives students exposure to several learning formats, including laboratory, classroom and hands-on training. The program boasts a high post-graduation placement rate, as there are consistently more available positions than there are graduates. Other students may choose to transfer to a four-year school and complete a full bachelor's degree. Students have access to tutoring and other student services, which are available both on campus and online. This includes counseling services, career planning, the IT help desk and disability services. Students who pursue an associate in arts degree in criminal justice will be able to choose from several elective courses depending on their concentration. The career services center helps students search for work-study jobs, as well as career searches at the local, state and national level 24 hours a day, seven days a week. There are academic support centers at every campus in the district. Students also have access to child care services, and can choose to participate in a wide range of on-campus activities, clubs, organizations and intramural sports. Students can also utilize the library and bookstore. Students pursuing an education in criminal justice have several options at Kirkwood Community College, including an associate of applied science degree and a liberal arts-focused associate of arts transfer degree. Both take two years to complete, but the first is designed for students who plan to enter the workforce immediately after graduation, and the second is for students who plan to achieve a full degree at a four-year institution. The college is accredited by the Higher Learning Commission NCA. Learning services include tutoring, an assistive technology lab, focused skill training and the TRIO program, which provides assistance from enrollment to graduation. Des Moines Area Community College boasts half a century of criminal justice education. The school's offerings focus on four fields of study: law enforcement, homeland security, corrections and electronic crime. No matter the concentration, students can choose to pursue either an associate of arts degree or an associate of science degree. Courses are offered throughout the year in the evening, during the day and online, depending on the class. In order to complete the program, students must complete an internship. There is also a TSA certificate program, which is open only to currently employed TSA personnel. Criminal justice students can pursue either an associate of applied science degree or an AAS-BS degree program. All students at Indian Hills are invited to participate in a wide range of clubs and activities, including intramural sports, visual arts, student government and athletics. Academic advising services include transfer information and a GPA calculator. Students also have access to health and wellness services, including medical assessments, fitness and stress reduction counseling, health promotion and various testing. Psychological and behavioral health services are also available, as are individual counseling, and crisis response and intervention. Through the criminal justice program at Saint Ambrose University, students will learn to be, ñadaptable, flexible, and ready.î The program prepares students for careers at the local, state, and federal level in the criminal justice field. Saint Ambrose also offers a master's degree in criminal justice in the traditional classroom setting, and online for students who are looking for a more flexible schedule. Writing tutorials and subject specific tutoring is available to students through the Student Success Center. The counseling center at the university provides individual and group counseling to ensure mental health for students and faculty alike. Students pursuing a criminal justice degree at Upper Iowa University can choose between obtaining an associate of arts degree after roughly two years (or 60 credits), or continuing on for a full bachelor of arts degree. Upper Iowa University offers classes online or face-to-face and multiple locations to choose from, including the Fayette campus, off-site education centers, online programs or self-paced programs. The criminal justice programs at Upper Iowa prepare students for careers in law enforcement, corrections, court systems and justice administration. Careers in criminal justice are expected to grow an average of 11 percent by 2022 according to the Department of Labor. The criminal justice program at Simpson College routinely returns high-scoring students on the Educational Testing Service's Major Field Test. The undergraduate criminal justice program at Simpson requires students to complete approximately 44 credits, which is ten courses plus the Standards of Professional Behavior capstone. Students can also choose to get a graduate degree in criminal justice at Simpson, which accommodates those who are already working in the field. Courses are typically eight weeks long and combine in person meetings once a week with an online learning system. On average, graduate programs can be completed in two years. A Bachelor of Arts degree in criminal justice at the University of Dubuque will expose students to the primary components of the criminal justice system: police, courts and corrections. The program enables students to apply for jobs in policing, corrections, courts and other related disciplines. Or students can continue their education toward a graduate degree in criminal justice, sociology and social work. The University also offers a number of clubs, organizations and student activities designed to further learning: the Justice Force (hands-on police related activities), the Justice League and the Spartan Nation Liberation Foundation (raise awareness about and prevent human trafficking). Students pursuing a criminal justice degree at Iowa Wesleyan University can expect a combination of coursework focusing on three basic components: the police, course and corrections, plus hands-on learning through internships. Total credits required for the undergraduate program are 36, while another 18 credits are required for support courses and/or for students who wish to pursue a minor instead. Most classes take place during day hours, however there are evening classes at area community colleges and a growing online program. Iowa Wesleyan is located in Mt. Pleasant and was formed in 1842. Students enjoy smaller class sizes and various arts and culture opportunities. Comparing the many criminal justice school options in Iowa can be another helpful way for students to narrow down their educational options. Use the search tool below to find the perfect criminal justice program by comparing tuition costs, financial aid options, student populations and program specializations offered by institution. There are a range of employment opportunities and career paths students interested in attending criminal justice school in Iowa can pursue. Take a look at some of the most common careers criminal justice students pursue in the state in the list below. For more details on the type of degree each career requires, click on the corner of each box. Students will also find more details about the number of employees found in each profession and their average salary in the state of Iowa. This may be a helpful gauge for students who are still deciding exactly what to focus their studies on while in criminal justice school. As a state that boasted one of the lowest unemployment rates in the nation in 2015, students attending criminal justice school in Iowa can see positive career potential as they prepare to enter the workforce. Take a look at the graphs below, which pinpoint the careers in criminal justice in Iowa that boast competitive annual salaries in comparison to the national average, as well as higher than average or on-par job growth projections. These charts also detail the degree requirements to work in Iowa to give criminal justice students a distinct study path. With such diverse career options available for criminal justice program graduates, it may help interested students to see what parts of the state of Iowa are most in need of protective service or legal employees. The chart below outlines which cities and regions of Iowa criminal justice professionals work in and how their wages vary by their employment location. A professional organization made up of in-house legal counsel for businesses in Iowa, the ACC-IA represents attorneys at over 60 companies in the state. Membership benefits include networking opportunities and educational and legal service programs. A branch of Iowa's government that coordinates regulatory assistance for citizens, small businesses, industry and local units of government. This group provides programs and services to individuals, communities, and businesses that seek to attract workforces to Iowa. In addition to helping start-ups, they help existing companies innovate and develop sustainable, adaptable programs. As part of state legislature, Iowa has regulations and policies in place for each step in the criminal justice system. The rules for criminals and correctional facilities are outlined in sections on this page. The Iowa Department of corrections provides general information such as research, press releases, institution statistics, and laws and regulations that the prisons in Iowa adhere to. This website provides information about the board and their departments, parole statistics, and online services for assistance in legal issues such as licensing, complaints, and databases. This is an association for all professionals working for Iowa correctional institutions. They provide information and training conferences to educate and support their members. Iowa's branch of the United States Department of Justice links to Appellate and Bankruptcy courts; District, State, and Local Courts; laws and regulations; lawyer resources; state agencies; and various departments that may assist with legal education opportunities or provide other information about Iowa's judicial system. The Iowa Judicial Branch provides information for attorneys, public, media and anyone interested in the court system. They provide online services and resources that detail court and judicial information and regulations. The public can find a lawyer through this website, while lawyers have access to continuing legal education resources and community engagement programs. The ALCU of Iowa is a local branch of the national ACLU group. They offer news and blogs on current events, statewide issues, and resources for community members to get involved with local civil liberties cases. This nonprofit is part of a national network of attorneys, professors, and students working to prevent wrongful convictions and to exonerate innocent persons in the Iowa prison system. Iowa's American Bar Association provides resources for lawyers and the public by advocating for legal accessibility. A resource for low-income Iowa citizens, this nonprofit provides legal assistance and education to clients as well as challenging policies and practices that harm low-income people. Citizens can air their grievances about government to this independent and impartial agency located in Des Moines. After investigating complaints about Iowa state and local government within their authority, the Ombudsman may make recommendations and publish a report. Information on basic training as well as continuing education, various specialty schools in Iowa, upcoming events, and further resources for law enforcement personnel. A division of the Iowa Department of Public Safety, this website has information on road conditions as well as AMBER alert and other safety services that the state patrol provides. This website leads to the various legal and public service divisions within this office, including the consumer protection and crime victim assistance. This professional association provides their members with useful information about law enforcement through training conferences, informative magazines, and legislative reports. This site has information on hunting, fishing, and boating; state parks; environmental conservation and protection, and employment opportunities. Notes on Iowa's regions and services as part of a regional protection network for the animals and habitats of the Midwest, with career resources for those interested in being special agents or wildlife inspectors. This environmental coalition works to preserve Iowa natural land and resources through education and promoting sustainable lifestyles. Their members and volunteers release useful information to help Iowa citizens maintain a healthy environment. SILT works with farmers, land owners, and citizens in Iowa to promote sustainable and healthy land for food crops. They provide resources for Iowans to help maintain the land.